All our books have working titles – quick phrases which we use just to distinguish which book we’re working on. The title for this one was the less than snappy ‘Snaefell book’. Obviously we couldn’t use that as the real title, but we’ve found that many of our publications name themselves. In other words something crops up which suggests itself as the perfect title. Two Fish for the Summit was no exception. Part of the preparation work for the book was to talk to a lot of people involved in the day-to-day running of the various things which happen on the mountain. We were interviewing the Bungalow Station Master – Bungalow is the only stop for the tramway on the way up the mountain – when a call came over the radio ‘two fish for the summit’. It caused a lot of laughter, but afterwards we thought that it encapsulated quite neatly the variety of sometimes odd things which happen on Snaefell. What it was all about was that the Summit Hotel had ordered some fish for an evening dinner event. 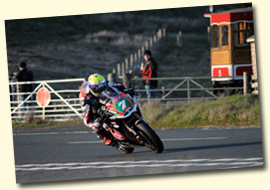 The fish had duly been carried on the Manx Electric Railway to Laxey and then been transferred onto the Snaefell Mountain Railway for the final leg of its journey. The station master at Laxey was informing the summit that said fish were on their way. And everything which goes up Snaefell has to be either carried by foot or transported on the Victorian railway – there’s no other way up the mountain beyond Bungalow. 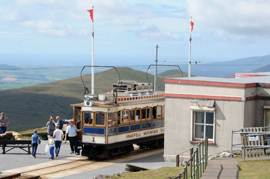 to the top of Snaefell on the Victorian Railway. Yet few people who arrive there realise the logistical challenges (and pitfalls!) which have to be met and solved on a daily basis. For example, there is no road access, so everything has to be transported either by foot or on the Victorian railway. 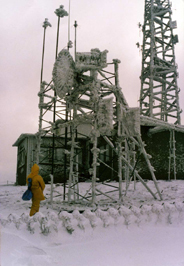 Winds can top 100mph, particularly in winter, so the radio masts and air traffic control equipment must be built and maintained to withstand the rigours of the weather. The Summit Hotel is so remote it has its own water purification and sewage system. 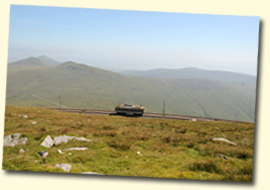 Two Fish for the Summit provides a fascinating insight into life and work on Snaefell.